Qualcomm’s faced quite a lot of heat, literally and otherwise for its Snapdragon 810. At what was being hailed at one time as one of the top processors in the market, the Snapdragon 810 is now seeing several manufacturers switching to alternates, and those who have stuck with the processor facing several problems. So when word surfaced that China’s Xiaomi was looking to use Qualcomm’s latest in its Mi Note Pro, launched today, we were all left a bit surprised. Well, the surprise is over, as it seems Qualcomm and Xiaomi have been working together on the Snapdragon 810 for quite a while now, with performance benchmarks showing an improved processor. Qualcomm’s gone ahead and released an upgraded Snapdragon 810 for the Xiaomi Mi Note Pro today. The Snapdragon that comes with the device is v2.1, which is the third iteration in Qualcomm’s nefarious CPU. 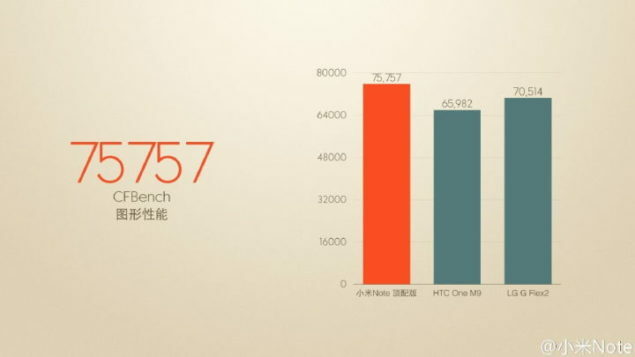 V2.1 seems to perform better than its predecessors according to Xiaomi’s benchmarks. Taking a look at CFBench scores above, the Mi Note Pro manages to gain a 10,000 point lead over the HTC One M9, which has faced the most number of problems due to the 810’s throttling problems. It also surpasses the G Flex 2. For those wondering about overheating issues on the Snapdragon 810, looks like Xiaomi and Qualcomm have got your covered over there as well on the Mi Note Pro. 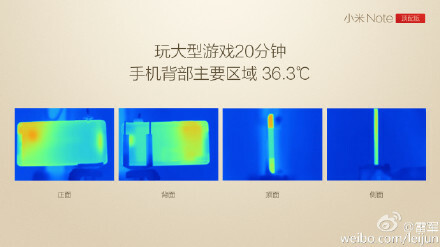 A thermal image comparison released by Xiaomi’s Lei Jun shows that the Mi Note Pro manages to take the heat quite responsibly and only reach a temperature of 97 F after 20 minutes of gaming. Could this mean a changed future for Qualcomm’s troubled SoC? 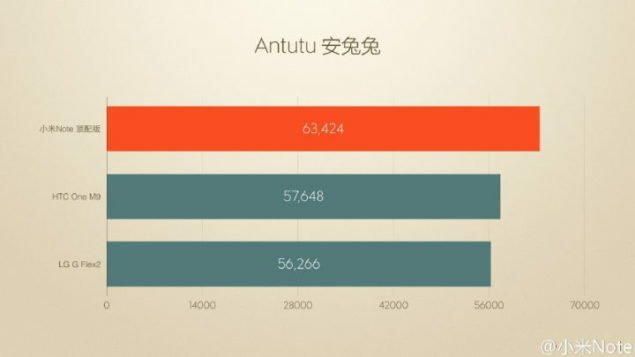 Antutu benchmarks further boost both the manufacturers’ claim. While the Mi Note Pro’s lead in Antutu isn’t close to the one in CFBench, it nevertheless still manages to overtake its Snapdragon 810 companions. Keep in mind that the Xiaomi Mi Note Pro comes with a Quad HD resolution that is more than what you get on the One M9 and the G Flex 2. We’ll know more as the Mi Note Pro becomes available in the market, bur for now, seems like v2.1 of the Snapdragon 810 might just do the trick for Qualcomm. Will the US manufacturer be looking to upgrade other devices with its SoC as well? Hopefully so. Stay tuned, we’ll keep you updated.